Following her accomplished sophomore film, the absorbing high school revenge tale Pluto (2012), Shin Su-won returns in glorious fashion with the searing Madonna. Meticulous, layered and yet seemingly effortless, this rewarding tale of mingled sorrow and redemption should go a long way towards establishing its director as a major talent on the global scene. Nurse assistant Hae-rim starts working in an exclusive hospital wing reserved for the ultra-wealthy and is charged with caring for an elderly comatose patient who is one of the hospital's greatest benefactors. For the last ten years, his son Sang-woo has been trying to keep him alive and when he needs a new heart, he approaches Hae-rim to find the family of a braindead Jane Doe and get the paperwork filled out to proceed with a transplant. As she delves deeper into the past of the patient, whom she discovers is pregnant, Hae-rim uncovers the story of a young woman whose journey through life has been a particularly hard one. Nicknamed Madonna, the woman went from bullied student to manipulated cubicle worker and eventually a desperate prostitute, beaten and left for dead by the side of a stream under an expressway. Though not a work with an overt social message, Madonna parlays a wealth of social subtexts into a dark but richly satisfying whole. At first an overweight girl teased by her classmates and scolded by her teacher for not having black hair, Madonna enters adult life as a phone operator who willingly submits herself to a superior, only to have him turn on her, which actuates a descent into destitution that is aligned with a demanding patriarchal order and an appearance-driven society. In a cruel irony, at the end of her journey (which is where we first meet her in the narrative) she has finally become valued for something beyond her appearance, her heart. Hae-rim, meanwhile, has her own dark secrets tucked away behind the bangs of her striking Cleopatra bob cut. She stalks the halls of the VIP ward and its $3000-a-night rooms and bears witness to the gross unfairness at play when the socially privileged try to get what they want. Though she accepts money from Sang-woo to search for Madonna's family, her pangs of guilt flutter early on and it isn't long before she tries to absolve herself of them when she begins to empathize with the unconscious young woman. Meanwhile, Sang-woo treats the hospital as his home and the staff as his servants, whether sleeping with a nurse or humiliating a young doctor. Cut out of an inheritance, he only seeks to keep his father alive for money, a fact which at one point he tries to rationalize to Hae-rim when she points out that the transplant will snuff out the light not just of the patient, but also of her unborn child. Yet this isn't even the first time the comatose old man has been given someone else's healthy heart. Shin has assembled a terrific cast for her dark drama and in casting her lead character, discovered an incredible new talent. In her very first role, Kwon So-hyun is a marvel as the titular character. 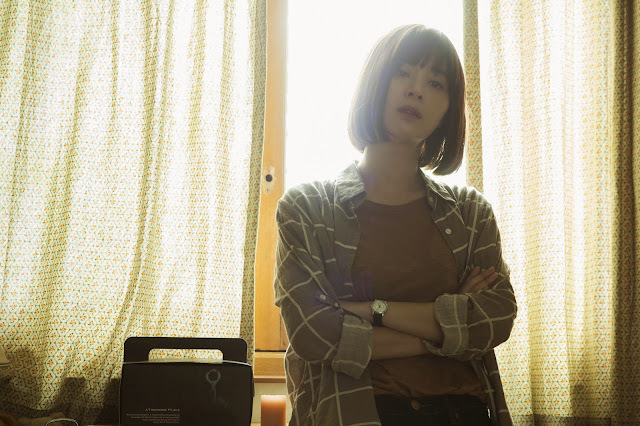 Timid, naive and often unable to comprehend the situations she finds herself in, Kwon's portrayal is unlike anything else in Korean cinema, yet it feels absolutely natural. Madonna's plight may be a difficult one to behold but Kwon ably breathes a delicate magnetism into her quiet protagonist. Playing Hae-rim, Bedevilled (2010) star Seo Young-hee delivers a subtle performance which magnificently captures the internalised conflicts beneath a calm exterior which is always on the verge of falling apart. Admirable in her restraint, Seo embodies a character who has already lost her own hope but not her humanity. While all the performers are wonderful, Park Hyun-young (who played the lead in Shin's 2010 debut Passerby #3) deserves a special mention as Madonna's nervy colleague on a factory floor. Just as she did with her prior film, Shin guides a strong production team, delivering a work that is tautly edited (by Lee Do-hyun), despite a complicated narrative, colorfully lensed (by Yoon Ji-won) and beautiful designed (by Lee Shin-hye). The only soft spots are the merely adequate piano strains of Ryu Jae-a, which strike an overly familiar chord in the realm of Korean social indies. Directed by a woman, featuring two female leads and securing a berth in Cannes' Un Certain Regard competition, Madonna bears many similarities to July Jung's A Girl at My Door. Though they approach their narratives differently, both films explore the plight of Korean woman in a way that is lyrical, realistic and balanced. In an industry that boasts only a handful of respected women filmmakers and rarely offers its actresses meaty parts, films like these are essential and in dire supply. With Madonna, Shin Su-won juggles an enormous amount of weighty themes, which proves to be a masterful balancing act that speaks to an unerring attention to detail, an absolute command of story and a tactile sensitivity that guides its characters through their moral quagmires and desperate realities. Enthralling and deeply felt, the assured Madonna proves once again that Korea's low-budget filmmakers can outbat the majors.